DVD is and will always be fragile at least in the following several years. It can be a headache to remove scratches from DVD, especially badly damaged DVD. 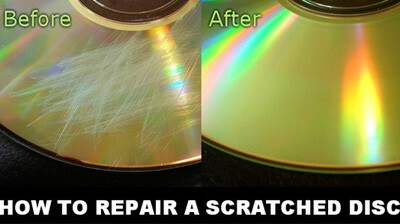 A cutting-edge DVD scratch remover machine can be expensive and is the last way to go. Here we introduce some cost-effective and simple ways to fix scratched DVD at home without further ado. A high-end program works great in scratched DVD fix, especially badly damaged ones that can't be handled with the help of some physical methods. MacX DVD Ripper Pro is such a DVD scratch remover program that is really helpful when your DVDs become unplayable, or your badly scratched discs cannot be rescued any more with below home remedies, or DVDs still can't play/freeze during playback on DVD player. The solid DVD scratch remover can bypass DVD scratches and copy unreadable DVD to DVD, ISO Image, Video TS folder, MP4, AVI, MOV, FLV, MTS, AVCHD etc. digital video formats with the same DVD video image quality kept, which makes your severely scratched DVDs playable again and never get damaged any more. It can remove scratches from DVD (homemade & copyprotected) automatically inside not physically, and create a completely intact DVD copy/backup needless of any other tools. With nice interface, it is very easy to learn how to remove disc scratches. 1 Free download the DVD scratch remover software for Mac or download Windows version for PC, and run it. It is fully compatible with Win 10 and the latest OS X 10.11.4 El Capitan. Insert your disc, click "DVD Disc" icon on the top of the right to load the disc. 2You are allowed to copy damaged DVD in Main Title Content Copy mode(no extra menus, small file size), Full Title Copy mode(all the move menus remained), etc. or copy DVD to DVD, MP4, AVI, MOV, MKV etc. The smart Disc scratch remover can skip damaged sector, users don't need to take any further measures. 3Click "Browse" button select a folder to save repaired scratched DVD file. 4Click "RUN" button to start removing scratches from DVD. as well as making a backup of your DVD. After the DVD ripping, you can sync the converted movies to iPhone iPad with MacX MediaTrans. Tips: If some parts of the movie file are destroyed and not playable at all even you have removed the scratches from DVD, try the edit function. You can cut and remove the ruined sector and join separate files into one. You have plenty of other simple way to fix slightly scratched DVD. Before we go, you should notice that these methods may cause further damage to your disc. In fact, it’s wiser for you to backup your DVD first in case of any damage as soon as you bought the DVD. Clean your hands before you take the following methods. 1. Heat - Material you need: light bulb or desk lamp. Turn a lamp on, hold the disc through the center of it and rotate it slowly on top of the lamp. Heating will make scratched disc play again. Material you need to remove DVD scratches: fresh banana peel/white toothpaste, cotton cloth, water. First, use a damp cloth to clean the disc dust, then smear white toothpaste onto the disc/or rub the disc with banana peel gently. Third, wait for some minutes and after that wash off the toothpaste/banana peel. Finally dry the DVD. Toothpaste/Banana peel helps take scratches off DVD, but only limited to very small scratches. Do not use warm water. Other similar methods to repair scratched DVD include peanut butter, wax, dish soap, alcohol, Petroleum Jelly, metal/glass/furniture polish, baking soda, Brasso, hair gel, etc. The steps are quite the same as toothpaste method. 4. Remember: DVD Backup Is A Key! It can be troublesome to remove scratches from DVD, what's worse, not all the damages can be removed by Disc scratch remover. Learn a lesson from DVD scratches removal - backup your DVD as soon as possible. DVD backup can avoid DVD scratches. Rip DVD free, play the copies instead of Disc, and make a copy on USB, hard drive, computer, etc. Need DVD decrypter Mac users can use? List of best DVD decrypters for Mac OS X that 100% work to rip encrypted/protected DVD movies and remove all copy protections covers reliable Mac DVD decrypters like Handbrake and other popular ones. Failed to play foreign DVDs due to region code restriction? The article will show you how to remove DVD region code with best DVD region killer software for flexible DVD playback anytime and anywhere. Impracticable to copy damaged DVD? Absolutely not. This article talks about the best solution to copy damaged DVD on Mac, both for slightly damaged and severely scratched DVDs. 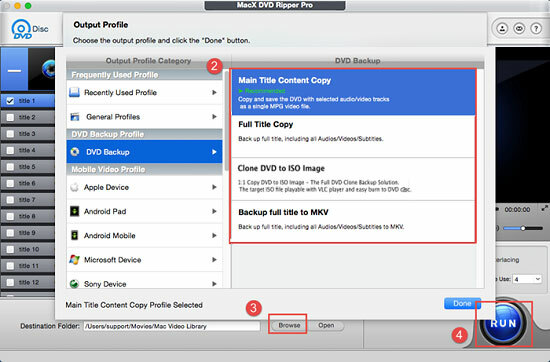 MacX DVD Ripper Pro is the best DVD Decrypter for macOS Sierra which can freely backup any DVD disc, ISO image, DVD folder on Mac (MacBook Air/Pro, iMac etc) in 1:1 quality to various video formats (MP4, MOV, MKV, AVI, FLV, etc) and portable devices with original quality.